Peach Cobbler Bread with candied pecans on top, oh my! Our peaches are ripening, and you can almost hear the little trees groaning in the orchard, they are so loaded down with fruit. I don’t know why this year is so unusually fruitful–was it that last year’s drought made the fruit trees think that maybe they were going to perish, and since they didn’t after all, they are relieved and therefore, overachieving? Or . . . are they just so renewed by this non-drought year that they’ve given up to bursting forth with fruit? What, after all, are the peach trees thinking?? And I do know, for you sticklers, that fruit trees don’t actually think. Or groan. I know this. But still. Maybe somebody can tell me why the orchard trees are just loaded this year; why the potato plants are bigger than ever; why the blueberry bushes were absolutely loaded, as well? It is amazing. While I’m waiting for an answer . . . (I’m going to enjoy this!) . . . I’ll share a recipe with you. Because I’m that sort of person, you know. Always thinking about you, my Gentle Reader, and about what might delight and please you. But just a word to the wise: you may need to sit yourself down before you read this recipe. It’s going to make your knees a bit weak, and you may even catch your breath. Your mouth is going to water and you’re going to need to quickly run to the store to buy a few peaches and perhaps a pound of pecans. On the other hand, you may have a few bushels of peaches that you need to make into something toothsome, and fresh home-grown peaches don’t last forever, so maybe I’d better just get started. First, make the candied pecans. Preheat oven to 250 degrees. Then stir together 1 cup brown sugar, cinnamon, and salt together in a bowl. Whisk egg white and water together in another bowl, until frothy. Toss pecans in egg white mixture, and then mix sugar mixture until pecans are evenly coated. Spread coated pecans onto baking sheet and bake, stirring every 15 minutes, until pecans are evenly coated. This will take about an hour, depending on how much time you use up snitching hot pecans off the sheet for yourself. Snitching, by its very nature, takes time. Don't burn your fingers, by the way. While pecans are cooling . . . Cream butter and sugar. Add eggs, one at a time, beating well after each one. Beat in water and extracts. Stir in peaches. Combine flour, soda, salt and powder; gradually add to the creamed mixture. Chop up candied and cooled pecans, stir in ¾ cup, saving ¼ cup for topping. Pour into greased 9-in. x 5-in loaf pan. Sprinkle reserved pecans on batter. Bake at 350 for 50-55 minutes, or until a toothpick inserted near the center comes out clean. Cool for about 10 minutes (you must, I know it's difficult) before removing from pan and cooling on wire rack. If you can't wait, be careful not to burn yourself on the hot peaches inside the bread! (That's a hypothetical cautionary note . . . hehee). Enjoy! 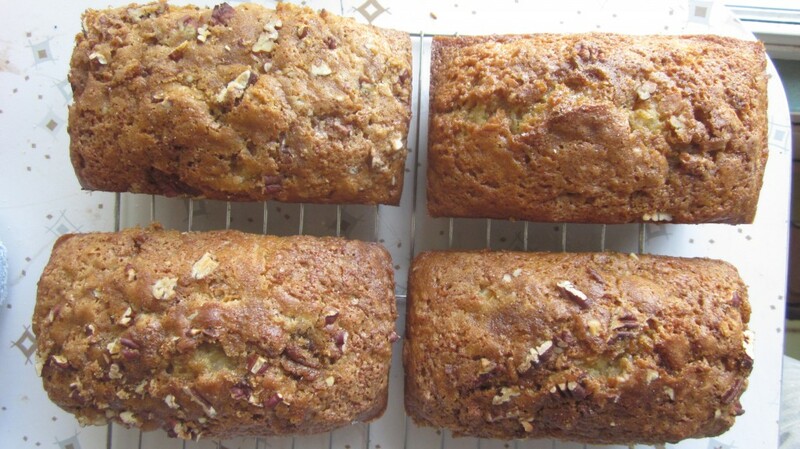 Just a side nut-related note: I’ve made this bread with chopped pecans, and I’ve made it with chopped candied pecans. I’ve got a sweet tooth that has no bounds, so I do like the candied pecans option, naturally. If you prefer a less-sweet addition to the bread (or if you don’t want to go to the trouble to candy your pecans first) then feel free to use non-candied pecans. It’s a free country. Of course, if you candy an entire pound of pecans, you’ll have lots leftover to sprinkle on your ice cream . . . and eat out of hand . . . and bribe your children to do their chores with . . . and enslave your significant other to do whatever . . . . just a thought . . . I see four loaves in the picture so I’ll just hurry outside and stand by the mail box. I love peaches and my wife loves pecans so this is like the best recipe I have ever received. It gets copied and goes to Mexico with me. Ripe peaches have just hit the market here in Wisconsin so I might be able to make some before leaving on the journey. Let me know how you like it, Chef, and if I thought that it would arrive there in perfect condition, I’d send you a couple of those loaves! Yum! I am going to make a run to the farmers market today. I feel like all I eat is fruit these days because of how much is available. I think I’ll try your recipes with other ones too! I’ve discovered that about our diet, too–we eat very fruit-heavy this time of year! This is a must try recipe! I can smell the bread baking already! I’d love to hear how you like it, Toni, when you make some! Next week the peaches at Cornell University might be ready for sale. They are a one hour drive from us but – well, we can’t grow peaches where I grow – Cornell is near the Finger Lakes and that proximity to the lake makes all the difference. They have donut peaches there – my favorite. I love a good baked good with good peaches and at least they sell Pennsylvania peaches at our local farmers market. Oh, donut peaches are amazing! I don’t know of anybody who grows them locally around here. 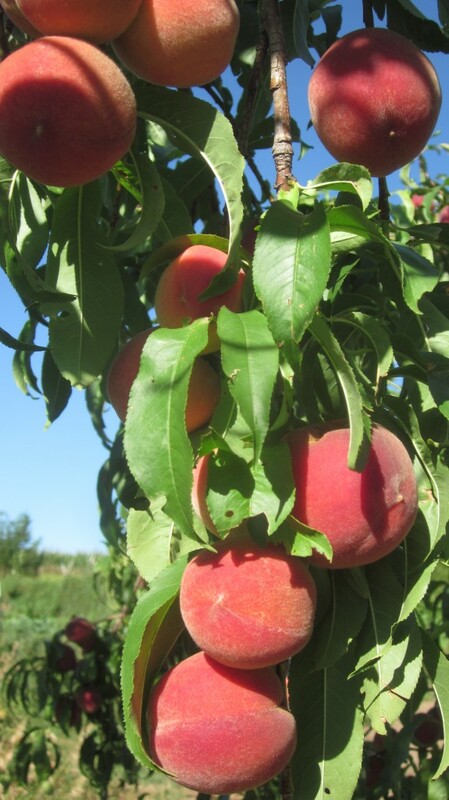 Our peach trees really produce well only once in several years, so this is a very special harvest for us! Your ripening peaches look wonderful. I know they’ll taste delicious. There’s nothing like home-grown fruit. I remember the flavor of those we used to grow in Australia. However, here in England, the weather’s not so kind. Most of the peaches offered for sale are grown abroad–mostly Spain. Of course, they’re picked before they’re ripe to pervent bruising during shipment. We end up losing out on flavour by ripening them at home. The earth is certainly pouring forth an abundance in your smallholding. It is a fruitfully abundant year here in the Midwest. I’m so thankful. It’s been a perfect year, weather-wise, for so many things. Thanks for your comment, my friend. I wish I could just mail you a big ole’ box of peaches! Darn I just put the peaches into jam and dehydrated the rest. I am saving it for next year. You are right tho, to fruit trees are doing wonderful this year. We are getting lots of apples and the cherry farm did very well this year, too. Maybe the trees enjoyed a break last year and are ready to go again. Debbie, that’s what I’ve been thinking. After a year off, they are refreshed and ready to work? !